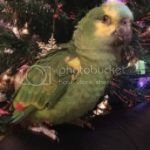 Parrot Forum • View topic - Cockatiel or lovebird? ParrotsForLife wrote: I own both cockatiels and a lovebird I got my lovebird Rio at 2 years old and wasnt hard to tame at all people say the fischer lovebirds are less aggressive but I dont know if thats true.Hes very sweet and both are good at learning tricks so its not true if anybody tells you theyre not.My cockatiels are also very sweet and cuddly but not all birds are like this.I got both my cockatiels young but have worked with older cockatiels. Your Rio is not a fischer's, my dear. And you've only had him for, what? a couple of weeks? Same with your tiels, one is a juvenile and the other is maybe going through puberty right now. Birds change as they become sexually mature and as they years go by and they can find no mates of their own. Especially aviary birds! Pajarita Rio is a fischer I thought the ones with the white eyelids were fischers? And Rio is 2 years old so hes in adult and both my tiels are Adults.And yeah that couple of weeks Rio is well settled in now. And Pajarita Rocko and Loki will always be cuddly its their personality. All im saying is Rocko will always be cuddly its the way he is dont know why you would even start a debate with my own birds like im the one living with them.And it dosent matter if Rio is only here a couple of weeks hes settled in and comfortable and im not saying hes very good with Rocko and Loki all the time but hes not very aggressive.Thats actually wrong Rio is a blue masked lovebird.Black cheeked lovebirds dont have a full black mask. Actually, yes, black-cheeked do have a full black mask, same as the black mask do. The only difference is in the way they look from the top and, as you only posted one single picture from kind of like the front and bottom, I can't tell so, yes, he could very well be a black masked and not a black cheeked. Check the top of his back, if there is white there, he is a black masked, if there isn't, he is a black cheeked. But he is definitely NOT a fischers. As to Rocco and Lokki, I hope they continue been affectionate with you but I don't need to be there and see them with you to know that juvenile and young adult birds change as they get older because they all do - and most especially aviary birds when you have both male and female (as you now have). Same as I don't need to be there to know that Rio is still in his honeymoon stage because, again, this is the way it is with all newly rehomed parrots. This is not a matter of my opinion versus yours, my dear, it's a matter of how birds behave as they change physically as they get older or more self-assured which, although there are variances by individual personalities, it's pretty standard when it comes to certain things. Pajarita wrote: Actually, yes, black-cheeked do have a full black mask, same as the black mask do. The only difference is in the way they look from the top and, as you only posted one single picture from kind of like the front and bottom, I can't tell so, yes, he could very well be a black masked and not a black cheeked. Check the top of his back, if there is white there, he is a black masked, if there isn't, he is a black cheeked. But he is definitely NOT a fischers. Sorry if I seemed rude.Yes I just checked Rio has white on the back.I always thought black masked lovebirds were fischers they come up when you search fischer lovebirds.I think Loki is certainly female now she finished moulting and now has lots of lovely pearls she had few when she was younger and now she has a lot I would say shes just about a year old now.The cockatiels are getting a new stainless steel cage.Also Loki is not bonded to anybody I spent the day with her yesterday trying to bond with her she dosent like to be touched either whereas Rocko cries for scratches she has never bitten anybody ever and I dont think shes capable of it and Rocko has a strong bond with me but would bite if I did something he didnt like. Last edited by Parrotkeeper02 on Sun Oct 18, 2015 5:34 am, edited 1 time in total. Sure I would love to own another bird like a lorikeet,a conure,a cockatoo,or an african grey but the problem is that owning these parrot species is completly ILEGAL in Colombia,thats why I am asking if a cockatiel or a lovebird is better because they are allowed. yaser_a wrote: Sure I would love to own another bird like a lorikeet,a conure,a cockatoo,or an african grey but the problem is that owning these parrot species is completly ILEGAL in Colombia,thats why I am asking if a cockatiel or a lovebird is better because they are allowed.